The chief sponsors of the 2010 financial reform law that created the controversial Consumer Financial Protection Bureau defended their handiwork on Thursday as legal and bureaucratic maneuvering continued over the issue of who is the agency’s true acting director. 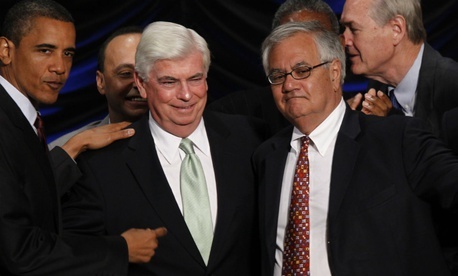 At the heart of the controversy is the proper interpretation of the 1998 Federal Vacancies Reform Act, which contains language that both former Sen. Chris Dodd, D-Conn., and former Rep. Barney Frank, D-Mass., now say they considered and rejected during the drafting of the final financial reform bill as a basis for determining proper succession plans at the CFPB. Their comments came the same day that White House Budget Director Mick Mulvaney, President Trump’s choice to double up as acting CFPB director, continued his daily tasks there. He told The Washington Times he is scrutinizing 14 lawsuits and 125 investigations that were left by predecessor Richard Cordray, who resigned last Friday. Deputy Director Leandra English, who has also laid a legal claim as Cordray’s appointee to serve as acting director, emailed the CFPB staff on Thursday evening urging them to continue policing the lending industry, Reuters reported. Legal briefs on the merits of the court case brought by English against President Trump were delivered on Friday to the U.S. District Court for the District of Columbia, which on Tuesday rejected English’s initial request for an immediate preliminary injunction to block Mulvaney’s takeover. Trump’s position that he has authority under the Vacancies Act to name the acting chief was backed by the legal counsel at the Justice Department and the CFPB itself. Frank agreed, saying there had been some disagreement between the House and Senate (not specifically from Republicans) on invoking the Vacancies Act, with Frank and many House members seeking an independent CFPB director but with a commission to supervise such issues as succession. “It took about two minutes” in the House-Senate conference for him to defer to Dodd’s approach of not invoking the Vacancies Act, Frank said. “I am puzzled by the notion of taking a different position from what Congress had in mind, the idea that you can pick and choose who you want” as acting director, he added. One motive for Trump’s intervention in selecting an acting director, he suggested, is that “someone as opposed to the agency as Mulvaney couldn’t get through” the Senate confirmation process. “Republicans running for reelection don’t want to go up against the voters” saying they helped large corporations exploit consumers, Frank said. An opposing interpretation came to Government Executive from Brian Wise, president of the U.S. Consumer Coalition, who has led a campaign to restructure the CFPB. “What this will ultimately come down to is a court decision on whether the structure of the bureau is unconstitutional,” he said referring to a successful challenge in 2016 at the appeals court, with a ruling that the bureau director’s wide-ranging powers lacked sufficient oversight. Wise agreed with the pro-CFPB side’s point that many financial agencies are independent of Congress, “but that pertains more on the operations side. It’s undisputed that the president has the responsibility to nominate a director for the CFPB,” he added, expressing skepticism that Mulvaney’s initial moves such as a hiring and rules freeze will have long-term impact. “Everyone knows the CFPB is not going anywhere,“ Wise added. “It’s here to stay” because it was given so many of the regulatory responsibilities formerly with such agencies as the Office of the Comptroller of the Currency, the Federal Deposit Insurance Corp. and the Federal Trade Commission. The Vacancies Act has always been subject to legal challenge and conflicting interpretations, noted Paul C. Light, a professor of public service at New York University who as congressional staffer helped draft a version of the act in the 1980s.